IG: @AfricanFoods: Yam and cornbeef stew with ripped plantain and pepper omelette. 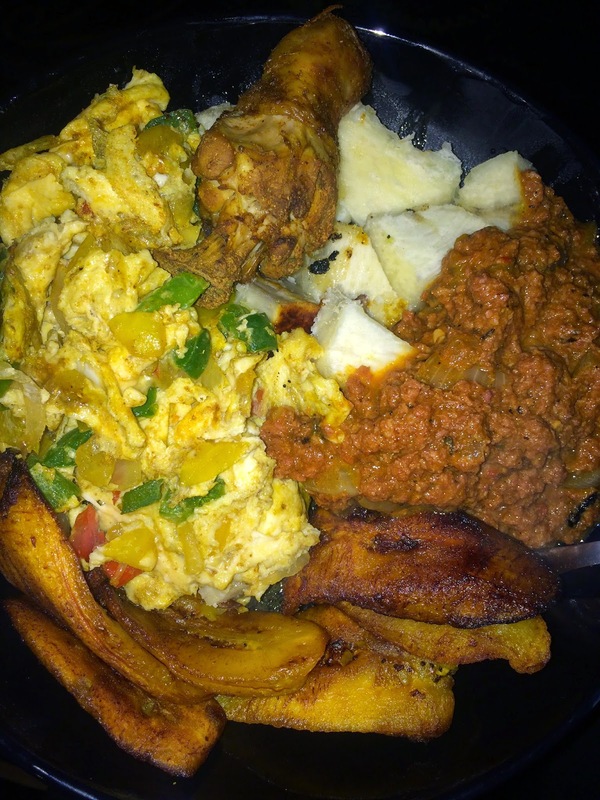 Yam and cornbeef stew with ripped plantain and pepper omelette. 1. Cut the yam in single bites block sizes. 2. Bring yam to boil seasoned with salt and sugar to give it a sweet taste. Cook till it soft. 3. Saute onions , season with every day season, chicken cubes and a bit of curry and salt. 4. Add cornbeef to onions and fry for a couple of minutes before adding your prepared tomatoe stew. 5. Cook for a couple more minutes, taste for seasoning. 8. ‎Beat together 3 eggs, add a pinch of salt and add to the onions and peppers. Dish the boiled yam on one side of the plate, with the cornbeef stew next to or on top‎. Add the plantains on the other side with the eggs next to or on top.